Sealing in the Summer – Super Stone, Inc.
Rule of thumb, heat makes things happen faster. Think about it, put an ice cube on a hot stove and it melts twice as fast as it would if you were to sit it on the counter. Heat makes molecules move faster. This applies to Super Stone sealers as well. When the surface temperature of your concrete goes up, our sealers react on a molecular level and when the surface temperature goes above 90⁰ F the products application and performance is negatively affected. Oh, and let me address surface temperature first, because it is not the same as air temperature. 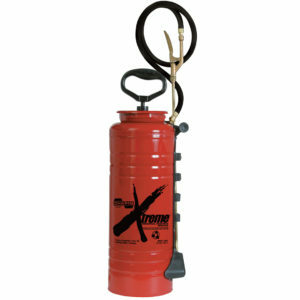 Air temperature is measured by the kinetic energy of gas molecules in the air. Simply put, it is the weather report meteorologist give us on the 6 am news about how the weather feels outside. Surface temperature on the other hand is the radiative skin temperature of the surface derived from solar radiation or how hot/cold the surface is to the touch at a particular location. Since surfaces heat and cool at faster speeds than air, it is important to measure the surface before applying sealer. You would do this using an Infrared Temperature Sensor. You can’t use a regular thermometer because the temperature of the tool coming in contact with the surface will alter the reading. SO, WHAT’S THE WORST THAT COULD HAPPEN? Bubbling and Blistering occur when the surface is too hot and the sealer forms a skin trapping solvent gas before the rest of the sealer gets a chance to cure. Gas bubbles are trapped in the sealer membrane while blisters are gas that makes it to the surface. Resin Strings “Spider-Webbing” occurs when the solvent in the sealer evaporates before it can adhere to the concrete surface. As a result, the resin stretches into strings due to the absence of the solvent. Using a roller or fine tip sprayer nozzle greatly increases this effect in hot or windy conditions. Diffusion/Haze shows up days after the sealer is applied as a white haze on the surface. 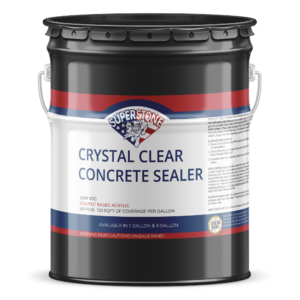 This happens when the sealer begins to lift from the concrete and light diffuses from the surface leaving a haze instead of the clear, clear reflectance that is seen if the sealer is properly adhered. Hot surface temperatures cause the sealer to cure before it can penetrate the concrete causing diffusion. Quick Drying Reducing Working Time occurs in hot temperatures when the sealer dries faster, reducing the working time. This can not only reduce the amount of time you have to work with or correct the product but can also lead to bubbling, blistering, resin strings, and whitening. Taking proper preparation steps and precautions will reduce the chance of only of these problems with your sealing project. Set your sealing projects in the early morning or evening when surface temperatures are above 50⁰ F and below 90⁰ F. Reschedule if high winds or rain is present. 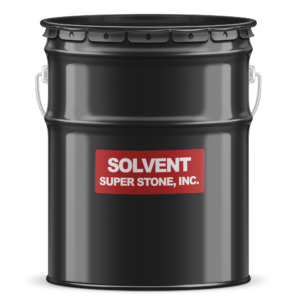 Reduce the surface temperature of your concrete by spraying a light layer of solvent on it prior to sealing. Use a sprayer to apply thin layers of sealer to your concrete opposed to rolling. Always mechanically mix your pigmented sealers before applying. Do not allow the sealer to puddle or collect in joints when applying. OH NO, I ALREADY MESSED UP! Bubbling and Blistering spray a light layer of solvent over the area when applying. If sealer has already dried, apply a light layer of solvent with a roller over area. Resin Strings Apply a light layer of solvent over the area and reseal. Diffusion/Haze Apply a light layer of solvent with a roller and reseal. If this is not effective the concrete must be stripped using Super Stone Strip-It-Off and resealed. 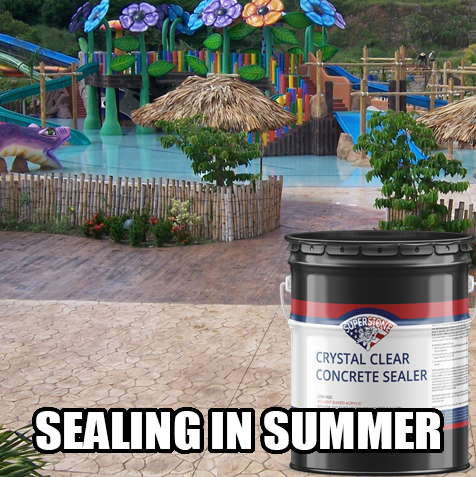 Sealing concrete in the summer is a great time to get ready for those fun-in-the-sun parties or holiday season. Secure your jobs with confidence as you now know the proper preparations and precautions to take when performing work. Below are a few recommended Super Stone products to get you started.